Practicing your swing at the local driving range may be considered a leisurely endeavor, but this niche business has its particular challenges for the entrepreneur. With an economic impact upwards of $60 billion, the golf industry is entering a mature phase and new entrants at all levels are looking at unique circumstances. In some areas, golf facilities have saturated the market so that facility owners are faced with overcapacity. Golf driving ranges are classified as alternative golf, a segment of the larger golf industry. In a benchmark report commissioned for the Golf 20/20 Conference in 2001, golf ranges and other alternative facilities were studied in detail for the first time. In 2001, stand-alone driving ranges numbered 2,805 – a full 50% of all alternative facilities in the United States. According to the Reference USA database there are a total of 2,806 companies listed as driving ranges in 2004. Of these, only 1,466 companies were listed with driving ranges as their primary line of business. Previously, the development, construction and popularity of golf driving ranges experienced much the same growth as the overall golf market. 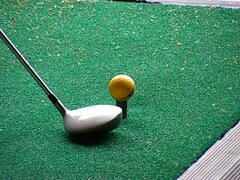 Starting in the 90’s, stand-alone driving ranges grew in number at 11% in 1990 to 13% in 1993 and settling at 6% in 1996. According to Golf Research Group, the development in the industry is lackluster – with approximately 50 new ranges being built and around 50 ranges disappearing each year. The US Driving Range Survey 2003 reports approximately 18% of all golf ranges generate a profit margin of 35% or greater. On the other end of the spectrum, 28% generate a profit margin of 20% or less. Reports published during the first quarter of 2004 reveal a 5.3% increase in golf rounds played. ”… after two years of declines due to the weak economy, a shaky employment picture, worldwide unrest and poor weather, recent gains in golf rounds are welcome.” These indicators signify general improvement for golf driving ranges, as well as, other alternative golf facilities. In the 2004 Industry Report by Golf 20/20, released in June 2004, golf’s best potential customers have been clearly identified. These demographic categories are youngsters, women and ethnic minorities. The industry will be dependent on this new fan base for introducing new recruits to the game of golf. Marketing efforts are now friendly to the entire family, akin to making the driving range a family entertainment venture. Additional amenities at driving ranges, e.g., batting cages and miniature golf will play a hand in exposing the recreational pastime to these previously overlooked demographic components. This material is based upon work supported by the U.S. Small Business Administration. Any opinions, findings, conclusions or recommendations expressed are those of SBDCNet and do not necessarily reflect the views of the U.S. SBA. This U.S. Small Business Administration (SBA) Grant is funded by the SBA. SBA’s funding is not an endorsement of any products, opinions, or services. All SBA funded programs are extended to the public on a nondiscriminatory basis. This material may be protected by Copyright law (Title 17 U.S. Code).